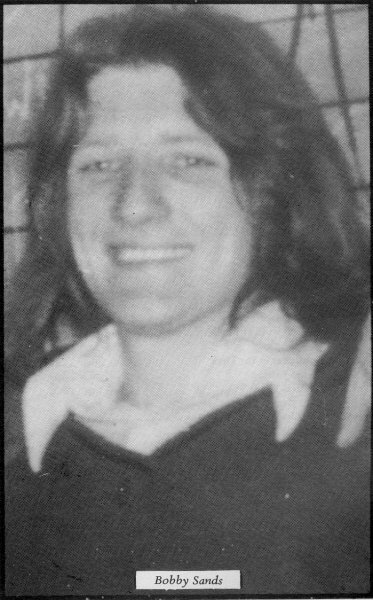 BOBBY SANDS was twenty seven years old when he died on the sixty sixth day of hunger-strike in the H-Block prison hospital, Long Kesh, on the 5th May 1981. The young IRA Volunteer who had spent almost the last nine years of his short life in prison as a result of his Irish republican activities was, by the time of his death, world-famous having been elected to the British parliament and having withstood pressures, political and moral (including an emissary from Pope John Paul II), for him to abandon his fast which was aimed at countering a criminalisation policy by the British government. That policy attempted to brand Irish resistance to the British occupation of Ireland as a criminal conspiracy without political motivation. In pursuit of that policy the British government attempted to force the prisoners to conform to regulations, wear a British criminal uniform and carry out compulsory, often degrading, prison work. The Irish republican prisoners who had been arrested under special laws, interrogated in special barracks (for example, Castlereagh) and sentenced in special non-jury courts refused to be criminalised and refused to recognise the authority of the prison regime, refused to wear the prison uniform or carry out prison work. In order to keep themselves warm the prisoners wrapped themselves in a blanket — and so the blanket protest began. For years the prisoners were held in solitary confinement and subjected to beatings, although due to overcrowding they eventually came to share a cell with another blanket man. In Armagh prison forty republican women also resisted the criminalisation programme and they too were persecuted by warders. From March 1978 until March 1981 the prisoners were on a no wash/no slop out protest which began when the prison authorities in a further attempt to break their will refused the prisoners access to toilets and washing facilities and forced the prisoners to live in filthy conditions. As a young boy Bobby played in the fields around Carnmoney Hill and Glengormley in the shadow of Cave Hill where the founding father of Irish Republicanism, Wolfe Tone, almost two hundred years ago stood and swore to overthrow English rule in Ireland. During his formative years Bobby, as he says himself in his prison diary was "a budding ornithologist". As one well-known H-Block ballad goes, "...A happy boy through green fields ran/And kept God’s and man’s laws." He also read and was influenced by the nationalist poet Ethna Carberry (Anna McManus) who coincidentally also grew up in this part of Belfast. He always had an interest in Irish history and when the civil rights movement burst on to the streets in 1968 the reaction of the RUC to peaceful protest evoked a nationalist response in the hearts of most Catholic youths. He left school in June 1969 and worked as an apprentice coach-builder for the next three years. Bobby never expressed any sectarian attitudes, in fact, he ran for a well-known Protestant club — the Willowfield Temperance Harriers, and lived in a Protestant estate. But at work he came under increasing intimidation and by 1972 the family were forced out of their home by threats and attacks. They moved to Twinbrook — a new housing estate in nationalist west Belfast. Eighteen-year-old Bobby was the eldest in a family of four children, the others being, Marcella, Bernadette and John. Bobby had joined the IRA and in October 1972 he was arrested and charged with possession of four shortarms which were found in a house. During his time in prison Bobby was a voracious reader not just of Irish, but of world history, and he emerged from the prison in March 1976 as a radical republican dedicated to an Irish Socialist Republic. In Twinbrook he helped form a tenants association and a youth club whilst still working as a full-time IRA Volunteer. However, six months later he was arrested on active-service following a bomb attack on a furniture warehouse. There was a gun battle between the IRA unit and the RUC and two of Bobby’s comrades were wounded. One shortarm was caught in the car and the four occupants were all charged with ‘illegal’ possession. Bobby was taken to Castlereagh where he was interrogated for seven days. He refused to talk to the Special Branch detectives and refused to recognise the court when charged. One of those also arrested with Bobby was Belfast man Joe McDonnell who replaced Bobby on the hunger-strike after his death and who himself eventually died after sixty-one days on the 8th July 1981. This British policy had been employed against past generations of republican prisoners — against the Fenians in English prisons and against IRA Volunteers following the 1916 Rising. In resisting criminalisation IRA Volunteers had resorted to the hunger-strike protest, the most famous case being Terence MacSwiney MP, Lord Mayor of Cork who died on the seventy fifth day of hunger-strike in Brixton prison in 1920. In the H-Blocks Bobby began writing short stories and poems under the pen-name ‘Marcella’, his sister’s name, which were published in ‘Republican News’ and then in the newly merged ‘An Phoblacht/Republican News’ after February 1979. He was P.R.O. of the protesting republican prisoners and succeeded Brendan Hughes as Commanding Officer of the blanket men when he took part in the first hunger-strike from October to December 1980. It was the failure of the British government to live up to the settlement of the first hunger-strike and to implement a promised enlightened prison regime which directly forced Bobby and his comrades on to a second hunger-strike. He led off the hunger-strike on 1st March 1981, two weeks in front of Francis Hughes, hoping that the sacrifice of his life and the political repercussions which it would unleash would perhaps force the British government into a settlement before any more of his comrades would have to die. However, by August 1981, nine other blanket men — Francis Hughes, Raymond McCreesh, Patsy O’Hara, Joe McDonnell, Martin Hurson, Kevin Lynch, Kieran Doherty, Thomas McElwee and Micky Devine — had also died on hunger-strike, due to British intransigence, itself secure by the inactivity of Irish politicians and Church leaders who did not raise their voices (or consciences) against Britain. On Saturday 3rd October 1981 the prisoners reluctantly abandoned their hunger-strike after a series of incidents in which families, encouraged by a campaign waged by the Catholic Church, sanctioned medical intervention when their sons or husbands lapsed into unconsciousness. The prisoners were effectively robbed of the weapon of the hunger-strike and so decided to end the historic fast which had lasted a marathon two hundred and seventeen days. Shortly after Bobby went on hunger-strike the independent MP for Fermanagh and South Tyrone, Frank Maguire, who was a champion of the prisoners’ cause, died of a heart attack. In the ensuing by-election Bobby stood on a ‘political prisoner’ ticket and was elected to the British parliament in a blaze of publicity. The result of that historic election showed the extent of support for the prisoners among the nationalist people (British propaganda had described the prisoners as having no support!) and should have been the occasion for the British Prime Minister, Mrs. Margaret Thatcher, settling the hunger-strike crisis. Instead the British not only refused to negotiate but enacted legislation to change the electoral law and prevent a republican prisoner candidate from standing for election. So much for British democracy! 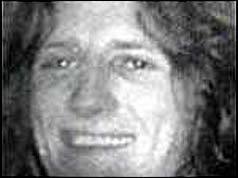 On the 5th May IRA Volunteer Bobby Sands MP died on the sixty-sixth day of hunger-strike. His name became a household word in Ireland, and his sacrifice (as did that of those who followed him) overturned British propaganda on Ireland and had a real effect in advancing the cause of Irish freedom. Some of his writings have already been published in pamphlet form and over 40,000 copies of his ‘prison diary’ have been sold. The majority of the following poems have never appeared in print before. Bobby wrote them during the last four years of his life in H Blocks 3, 4, 5 or 6. They were written on pieces of government issue toilet roll or on the rice paper of contraband cigarette roll-ups with the refill of a biro pen which he kept hidden inside his body. The H-Block Trilogy covers the ‘conveyor-belt system’ in the north of Ireland — interrogation, the Diplock Courts and the H-Block hell itself. In Castlereagh one is always watched. The Watcher is a uniformed RUC man who spies through the ‘Judas’, opens and locks the cell door and hands over the prisoner to detectives. The Watcher notes what one eats and when one goes to the toilet one is even watched on the seat. They see but don’t witness healthy youths being taken out to interrogation and brought back battered and bruised. The only ventilation in the cells comes through a blast of air delivered from a vent above the cell door, it was from this vent that the RUC alleged that Brian Maguire hung himself in May 1978. However, the vent was of insufficient strength to support a man’s weight and one of those rounded up and interrogated by the RUC around this time, Phelim Hamill, from Belfast, states that the RUC attempted to strangle him with a towel in order to make him sign an incriminating statement. He passed out on a number of occasions as a result of this choking. Also, the Amnesty International report of June 1979 reported that there were fourteen separate allegations of attempted strangulation reported by Castlereagh victims in this period. Most nationalist people believe that over-zealous RUC interrogators in attempting to force Maguire to sign a statement attempted to strangle him, that he did choke to death, and that they then staged the fake suicide to cover up for the murder. In this poem one can feel the fear creap through the prisoners who are always expecting the worst. Was it their turn for interrogation? There is a relative sigh of relief as the Watcher passes by one’s cell to visit another poor victim. Suddenly in the poem the young republican having successfully withstood an interrogation finds himself confronted by ghosts "with faces white and small" (dead hunger-strikers?). They carried crosses bearing the name of Brian Maguire, they were the "marching dead," and they were bearded blanket men haunting the origin of their imprisonment and where one of their comrades, who never reached the H-Blocks, was murdered. Then they are suddenly replaced by the monstrous forces of darkness, representing British law and the rich who spun the thread for the "scaffold black" that murdered Brian Maguire. But, Bobby asserts, the beasts of Castlereagh will stand before God on Judgement Day and "must answer every sin." 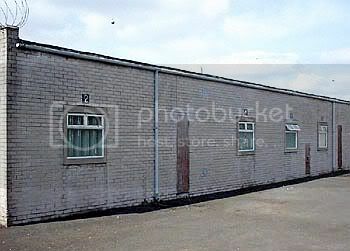 ‘The Torture Mill — H-Block’ opens with the violent death of a Screw, immediate joy’ in the H-Blocks at his death and then reflection on how the system has regretfully made them hate. As the news reaches the prisoners there is an excitement and then a dread of the retaliation which will follow in the morning. To calm nerves men, denied cigarettes, roll up and smoke the threads of their very blankets. And then comes the dreaded dawn and the beatings. Bobby draws comparisons between the pleasures of life — dancing, falling in love, walking in the countryside, basking in the sun — with the terrible conditions in the H-Blocks. The humour of the poem, mixed as it is with tragedy, shows that Bobby has not been defeated and we can all share the triumph of the spirit of the prisoners over those adverse surroundings when we are told what happens as the Screws leave after inflicting beatings on everyone. Bobby draws from his own experience for these poems though they are by no means absolutely autobiographical. For example, Bobby was sentenced to fourteen years whereas the prisoner in ‘Dip. lock Court’ is sentenced to thirty years, and, of course, Bobby was arrested and in the H-Blocks years before Brian Maguire was killed in Castlereagh. In the ‘Rhythm of Time’ Bobby asserts that the spirit of freedom and injustice has been innate to man from the beginning, though he only draws upon its inspiration against life’s experiences of evil. In tracing this spirit Bobby demonstrates an exceptional grasp of history and memory recall (he was denied books, newspapers, radio or TV, and mental stimulation for the last four years of his life). Wat the Tyler, for example, was an English peasant who in 1381 challenged and led an uprising against the English monarchy. The persecuted early Christians, slaves, peasants, the American Indians and Irish republican freedom fighters share the stage of history against tyranny. And the driving force against oppression, as Bobby concludes, is the moral superiority of the oppressed. It has been said that were Bobby alive to see these poems today he would have rewritten or changed some of the simpler rhyming words. But that is to miss the point. These poems were written by a young man under the most depressing of conditions. 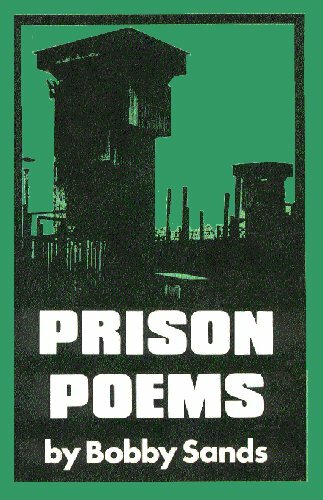 More importantly his poetry is the raw literature of the H-Block prison protest which hundreds of naked men stood up against their cell doors (in the late of night when the Screws left the wings) to listen to and to applaud. — Danny Morrison, October 1981. "Where an injustice is being ignored, you can draw attention to it by creating a bigger issue, namely fasting. Gandhi did it in India. It´s a very legitimate way." Republicans from all over West Cork attended a hunger strike commemoration in Skibbereen on Saturday 25 August. Close on 200 participated in the march and this grew to well over 300 for the main commemoration in the square. 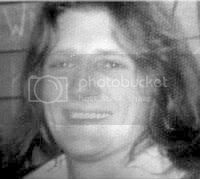 ``I got to know Bobby Sands in 1974 in Long Kesh - like all the other hunger strikers he was just an ordinary person. Bobby was a great football player, athlete, musician and had tremendous love for his language and culture. The British thought they were striking at the weakest and most vulnerable, but in reality they were taking on the bravest and the best of our people . By their courage and sacrifices they preserved the honour and integrity of the struggle for freedom and justice in Ireland. Owen Carron spoke of how he has spoken at commemorations all over Ireland this Summer and is still struck even 20 years after, by the many people who are still being moved by the hunger strikers, many of whom were not born at that time. ``I thought that when republicans flocked from all over Ireland and got Bobby Sands elected MP for Fermanagh and South Tyrone that that would save his life. But the cold and ruthless British government wouldnt meet the prisoners wouldn't recognise their mandate . It didn't matter that 100,000 people marched after the coffin of Bobby Sands, that the Longshoreman's union blocked the port of New York and that the parliament of New Delhi stood in silence. ``I am heartened to come here tonight to see that many people down here in Skibbereen understand that the struggle that is going on in the Six Counties is the same struggle, whether you live in Derry, Belfast, Leitrim or Skibbereen. Before the ceremony was concluded the cathaoirleach Donnchadh Ó Seaghdha paid tribute to Joseph O'Sullivan of Fachtnas Terrace, who left his sick bed to be present. Joe was the only remaining link with a previous generation of republicans at the time of the hunger strikes. Vandals defaced the granite memorial to hunger striker Bobby Sands with paint prior to its official unveiling in Enniskillen at the weekend. In the hours before Fermanagh/south Tyrone MP Ms. Michelle Gildernew unveiled the monument, the paint was successfully removed from the engraved granite structure which stands at the Paupers’ Graveyard in Cornagrade, in the shadow of a sculpture erected to remember the victims of the famine. Before the unveiling ceremony, hundreds of people took part in a parade which left Kilmacormick at 3.30 p.m. on Sunday afternoon. It continued into town along Queen Street and Darling Street before returning to the Paupers’ Graveyard for the ceremony. The Mountain Road Pipe Band and Strabane Memorial Flute Band were part of the procession. The Sands family did not attend. The event was organised by the Tom Flatley Sinn Fein cumann to mark the 21st anniversary of Bobby Sands’ death. Bobby Sands was an icon for people locally, Councillor Gerry McHugh MLA told the assembled crowd. “Such was the feeling about Bobby Sands and his connection with Fermanagh/south Tyrone at the time the locals wanted to create some sort of tribute to him,” he said. Looking back at his election as MP for the area, he said: “It was the start of the electoral process for Sinn Fein in this particular phase. Election gains at that particular time pointed there were political gains to be made from taking part in an election”. He spoke about the Twinbrook man as a “son, husband and father”. The Fermanagh MLA told the gathering of a letter he had received from Bobby Sands on his second week on hunger strike. “He wrote to me telling me that he had put on a fine and hopeful face to those around him on the wing, to his clan on visits. But he told me he had no intention of trying to pretend anything to me. He was determined to do what he had done and he knew that the British would show no mercy. Yet he was confident that by his actions his comrades coming behind, and a whole generation of young still unborn, would be so inspired as to ensure his goal, his dream, his Aisling would become a reality,” he said. The event on Sunday gave people the opportunity to reminisce about the events of 1980 to 1981, said Councillor Pat Cox, who was involved in the Bobby Sands election campaign. He recalled that the entire campaign was run out of the front room of a house on Water Street in Enniskillen. “The people were afraid of intimidation . . the people translated their fears into votes,” Councillor Cox said. Fermanagh/south Tyrone MP Ms. Michelle Gildernew spoke of Sinn Fein’s electoral successes in more recent times, in particular the General election in the Republic. “I am honoured to speak at the unveiling of this memorial to Volunteer Bobby Sands MP who sacrificed his life that we, and the future generations, could live in an Ireland of equals, free from foreign rule. And they gave him 30,000 votes while in captivity. Australian Aid for Ireland has produced a special issue of its magazine, Towards 32, to mark the 20th anniversary of the 1981 hunger strike. The following article from that magazine, penned by CHRIS RALEIGH, traces the story of Australia's support for the prison struggle and the hunger strikers. As Bobby Sands embarked on hunger strike in Long Kesh, Australia had only recently replaced God Save the Queen as its national anthem. So it is hardly surprising that the Australian branches of the National H-Block/Armagh Committee faced a daunting challenge in swaying the mood of the Australian people towards the demands of the hunger strikers. However, sway the mood they did, and through a mixture of courageous and innovative actions and unrelenting hard work, they convinced political parties, trade unions, and most importantly, the general public of the moral righteousness of the prisoner's demand for political status. In doing this they forever changed the manner in which many ordinary Australians viewed the prison protest and the overall struggle for Irish freedom. To counter this, the H-Block committees began to reach out to all sections of the Irish and Australian communities to articulate and expound the position of the protesting POWs. Rallies and marches, pickets, leafleting, and political education were combined to build a broad-based public spectrum to highlight the five demands. The Labour Movement, a traditional republican support base, was tapped into first, with massive support received from dozens of trade unions throughout the country. The New South Wales South Coast Trade and Labour Council, at the time the largest provincial Labour Council in Australia, confirmed its support for the POWs' five demands. The members of the H-Block committees built on this support from the union movement to bring pressure to bear on the Australian Labour Party (ALP), at the time the federal opposition. Local branch meetings were addressed by committee members in all of the major cities, with the majority of the ALP branches, consequently sending telegrams to Margaret Thatcher condemning her intransigence and insisting that the prisoners' demands be granted. On the streets, a campaign of leafleting major commuter centres in the capital cities was undertaken. At ferry and bus stations and outside the offices of British Airways and the British consulates, stood republican activists, handing out leaflets and receiving wishes of support, verbal abuse, and on isolated occasions even physical attack. On 1 May, as Bobby Sands entered the 61st day of his hunger strike, over 200 people held a silent, candlelit vigil in the centre of Sydney. Two men wearing nothing but blankets stood at the head for six hours, providing powerful imagery for the city's seething masses, weaving their way home. In Melbourne, some 2,000 people attended a similar requiem mass and 30 members of the Victoria state parliament from across the political spectrum put their names to a death notice in The Age, ``In tribute to our fellow parliamentarian, Bobby Sands, who, like Kevin Barry, believed in liberty and has been prepared to die for it''. In Adelaide, a 48-hour hunger strike was staged on the steps of Parliament House and in Brisbane, hundreds congregated to protest the death and vent their anger. After the deaths of Francis Hughes, Raymond McCreesh and Patsy O'Hara, 1,500 marched behind four black-clad coffins bearing the faces of the four men. The rally then heard notices from Gerry Adams and Bernadette McAliskey. From these tragic deaths sprang a revitalisation of Irish republicanism in Australia. The H-Block committees received unprecedented support and new branches were founded. Media appearances and street activism increased. No British establishment figure could escape the clutches of the protesting republicans. At Port Kembla, north of Sydney, in June of 1981, a British ship, The Cape Horn, was forced to stay docked as the Waterside Workers Federation placed a 48-hour blanket ban on loading the ship's cargo, tons of grain bound for England, in solidarity with the POWs. The captain, a Scottish royalist, was said to be incensed. At a function in nearby Newcastle to celebrate a royal wedding, over 50 H-Block supporters staged a picket on the steps of the offending restaurant. O'Connor then marched to the Irish National Association and began his fast immediately. After 18 days of the strike, two members of the Sydney H-Block committee met with acting Australian Prime Minister Doug Anthony (yet again highlighting the influence the H-Block committees held), only to be told that the problem was an internal matter for the British government. Media attention began to grow as the days dragged on and Eamon's health deteriorated. On his 37th day without food, a specific request to end his protest was received from the leadership of the Republican Movement, which finally persuaded him to call off his protest. When the hunger strike was finally called off, in Australia, as in Ireland, a strange void was created. As gradually the five demands where phased in, a sense of victory began to set in amongst the Australian committees. Not a euphoric victory, but a victory through struggle, a victory that had cost ten lives. The Voice of the Irish Republican Movement. “CONTRARY to allegations made in the news media, there was not a straight line from the election of Bobby Sands in 1981 to the Stormont Agreement of 1998”, said Ruairí Ó Brádaigh, President of Republican Sinn Féin at a seminar in Lisnaskea, Co Fermanagh (2pm, Donn Carragh Hotel) on Saturday, May 5, the 20th anniversary of Bobby Sands’ death on hunger strike. Other speakers included former hunger strikers Tommy McKearney, Tyrone and John Nixon, Armagh. The commemorative lectures were organised by Fermanagh Comhairle Ceantair, Republican Sinn Féin. “Rather was the line from March, April and May 1981 to the same months in 1998 disfigured and distorted by an internal power-struggle for the leadership of Sinn Féin accompanied and followed by deceit and artifice as the ideals of Bobby Sands were steadily perverted and a section of the then powerful revolutionary Republican Movement turned into a constitutional party. 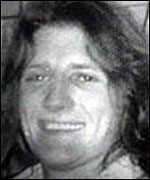 Those who had opposed any electoral intervention during the 1970s and were initially against Bobby Sands being a candidate in the Fermanagh-South Tyrone by-election, when ultimately convinced of nominating the hunger striking prisoner did a complete volte face on his election and sought to contest every and any election regardless of the circumstances. They organised a section of the political prisoners and Sands’s elected successor as H-Block representative for Fermanagh -South Tyrone to throw weight against the ÉIRE NUA policy of a new Federal Ireland of the four provinces, including a nine-county Ulster, and succeeded in having it jettisoned at the Ard Fheis of Sinn Féin in the autumn of 1981. This forward-looking policy of the movement for more than 10 years was thrown out to the slogan that it was “a sop to the unionists”. Bobby Sands commenced his hunger strike on March 1 and Frank Maguire MP for Fermanagh-South Tyrone died on March 5. Following the British government’s reneging on the settlement of the 53-day hunger strike of late 1950 and the start of another fast, it was felt that a new factor was needed to galvanise support in Ireland and abroad. The idea of putting forward Sands as a candidate was the brain-child of a man of vision, Dáithí Ó Conaill, a long time friend of the Maguire family. It was he who proposed it to a meeting of the Ard-Chomhairle of Sinn Féin and the opposition was finally persuaded to support the move. Incidentally, the “armalite and the ballot-box” strategy was nothing new. It dated from 1917 and as a younger man I was active in Fermanagh-South Tyrone in the campaign which elected Philip Clarke, a prisoner candidate, in 1955. Later, in 1966 I was the Republican candidate in the same constituency. Its place in history is now well marked out due to the events being commemorated today. Twenty years subsequent to the sacrifice of Bobby Sands and his nine comrades, the political status they sought and achieved has again been withdrawn from Republican prisoners. Tommy Crossan of Belfast leads the struggle in Maghaberry Prison, Co. Antrim and was on May 2 selected as candidate for West Belfast in the coming Westminster election in order to highlight and build support for the restoration of political status to political prisoners. Those who are loud in their support for the hunger strikers of 20 years ago are silent today in the face of the plight of Republican prisoners in Maghaberry whose physical safety even is in danger from loyalists and ordinary prisoners. The former Republicans who rebuilt the Stormont assembly are now part of the British system in Ireland and have turned their backs on the successors of Bobby Sands and his comrades. Their progress since 1981 was not a line of advance but a gradual retreat from the ideals that motivated the hunger strikers of 20 years ago. Their policy of acceptance of Leinster House and Stormont and of the Unionist Veto on Irish national independence has now become a classic counter-revolutionary stance. Yet the unsullied ideals of the hunger strikers who suffered such painful and agonising deaths continue to motivate and inspire young people to strive for Irish freedom. Sands, like Pearse, Connolly and MacSwiney before him has left us copious writings which makes it very difficult to misrepresent him. He did not die for mere civil rights under English rule nor for a spurious equality, but for human dignity and prisoner-of-war treatment as part of the on-going struggle for Irish national liberation and the liberation of all humankind. He has amply documented his case for those who wish to be aware of it. May his noble spirit and those of all our hunger strikers enjoy the peace denied to them on this earth. Run screaming, napalmed through the night air. And where the oil flows blackest, the street runs red. And tomorrow's wretch will leave its mother's womb. Some times when you look at the photos of the murals, you forget that they are attached to other structures. This photo shows a different view. The BBC has this feature where you can read the news of any day in history. These were the stories and videos on the day Bobby died, May 5, 1981, including an interview with his mother Rosaleen. Please keep in mind that it IS the BBC. IF YOU type “This Day in History, May 5th” into the search engines of the History Channel or most newspapers it will show up something along the lines of, “In 1981, Irish Republican Army hunger-striker Bobby Sands died at the Maze Prison in Northern Ireland in his 66th day without food” (‘Boston Globe’). In other words, Bobby Sands’ name has been immortalised by his and his comrades’ hunger strikes twenty-two years ago..
Travel almost anywhere in the world, mention that you are from Ireland, and the response you are likely to get is, “Ireland – Bobby Sands!” No one answers, “England – Mrs Thatcher!” though nowadays they might answer, “England – George Bush!” Bobby Sands’ name lives on and the legacy of the hunger strikers continues to inspire not just Irish republicans but many nationalities who associate it with nobility, sacrifice and courage in the face of a bullying power. The poll attracted submissions from all around the world. Nearly 150,000 votes were received from 153 countries, nominating over 6,500 songs. Even The Beatles failed to make the top ten.. One of the strongest contenders was a patriotic Hindu song, ‘Vande Mataram’, which is considered by many as India’s national song. These weren’t the people, the community I saw and was with during those dark, sad days: dignified people who were shot and pulverised on their own streets for daring to oppose British policy. Kate Adie claims that what came out of Belfast was, “Efficient and carefully judged journalism”, but in her own words she reveals something of the deep-seated prejudices which informed a style of reporting which kept the British public in ignorance and which did a disservice to the living and the dead. Where the night shades danced and played. Marched out to win a dream. That the Gael might but succeed. To fight along with Tone. And the English cannon roared. A nation's blood was poured. To hear the woman cry. 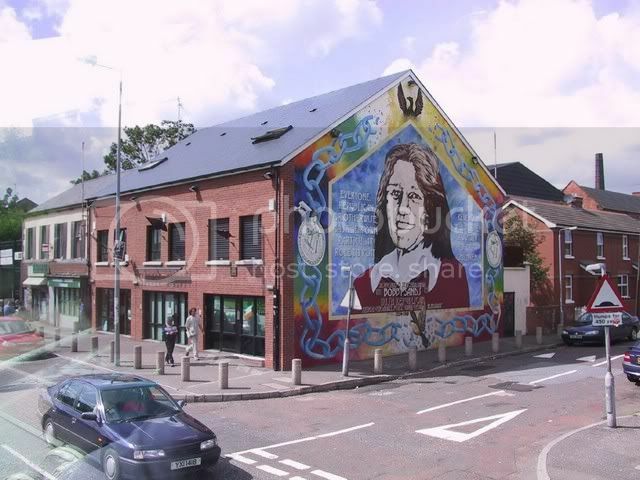 Bobby Sands was born in 1954 in Rathcoole, a predominantly loyalist district of north Belfast. His twenty-seventh birthday fell on the ninth day of his sixty-six day hunger-strike. The sectarian realities of ghetto life materialised early in Bobby's life when at the age of seven his family were forced to move home owing to loyalist intimidation even as early as 1962. Of this time Bobby himself later wrote: "1 was only a working-class boext three years in the cages of Long Kesh where he had political prisoner status. During this time Bobby read widely and taught himself Irish which he was later to teach the other blanket men in the H-Blocks. Released in 1976 Bobby returned to his family in Twinbrook. He reported back to his local unit and went straight back into the continuing struggle. Bobby set himself to work tackling the social issues which affected the Twinbrook area. Here he became a community activist. Within six months Bobby was arrested again. There had been a bomb attack on the Balmoral Furniture Company at Dunmurray, followed by a gun-battle in which two men were wounded. Bobby was in a car near the scene with three other young men. The R.U.C. captured them and found a revolver in the car. The six men were taken to Castlereagh and were subjected to brutal interrogations for six days. Bobby refused to answer any questions during his interrogation except his name, age and address. 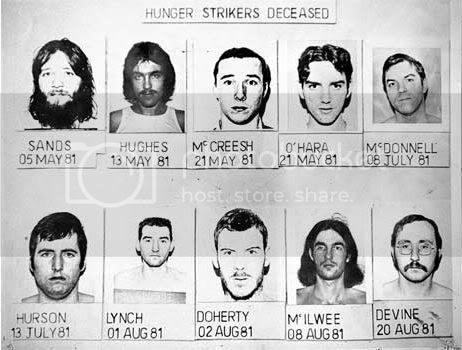 On October 27th 1980, following the breakdown of talks between the British direct-ruler in the North, Humphrey Atkins and Cardinal 0 Fiaich, the Irish Catholic primate, seven prisoners in the H-Blocks began a hunger-strike. Bobby volunteered for the fast but instead he succeeded, as 0/C, Brendan Hughes, who went on hunger strike. That hunger-strike ended after 53 days when the British agreed to implement a liberal and enlightened prison regime. But as soon as the hunger-strike was over the Brits reneged and Bobby's attempts to negotiate with the prison governor were rebuffed. Thus British intransigence forced a second hunger-strike which Bobby led on March 1st 1981. He insisted on starting two weeks in front on the others so that perhaps his death could secure the five demands and save their lives. On March 30th, he was nominated as candidate for the Fermanagh and South Tyrone by-election caused by the sudden death of Frank Maguire, an independent M.P. who supported the prisoners' cause. In an historic by-election, which was the subject of international interest, Bobby was victorious over his unionist rival. But the British still refused to treat with the prisoners and at 1.17am on Tuesday May 5th, having completed 65 days on hunger strike, Bobby Sands, M.P., died in the H-Block prison hospital at Long Kesh. LALKAR is a bi-monthly anti-imperialist newspaper written in the UK. It contains news and analysis of current events and labour history from the perspective of the proletariat and its struggle for social emancipation, as well as from the perspective of the oppressed people and their struggle against imperialism and for national liberation. This year marks the 20th anniversary of the hunger strike undertaken by the Republican prisoners in the notorious Maze prison, with even more notorious H-Blocks, in which 10 young men were to die a martyr’s death, one after the other, over 172 traumatic days. The strike was begun to press the demand for recognition of their status as political prisoners (a status once recognised but taken away by an earlier Labour government in Britain) rather than being treated as common criminals. 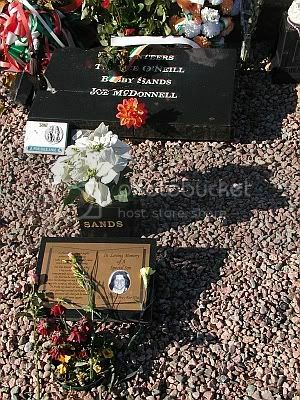 Bobby Sands was the first one to go on the hunger strike, and the first to die a hero’s death. He went on hunger strike on 1st March 1981. May 5 this year marks the 20th anniversary of his martyrdom. The decision to go on the hunger strike was the prisoners’ and the prisoners’ alone. They were young men fired by a hatred of British colonialism and with a burning desire to free their country from nearly eight centuries of British occupation – the noblest kind that any country is capable of producing. Bobby Sands and his comrades showed an astonishing resolve that earned then the grudging admiration of even their enemies. "Albert", a prison officer in the Maze, who was on guard duty at the time of the death of Bobby Sands, says "the best grub went in. We were out to break them, but you’ve got to hand it to them. There was not any of them ever tried to break off and eat, not once". "Albert" says that the other prison officers hated the Republican prisoners and treated them as "the lowest form of life" in the period of the "blanket protest" (prisoners refusing to wear prison clothes – only blankets), which developed in "dirty protest", with the prisoners smearing themselves with their own excrement. "Albert" adds "… during the hunger strike we began to look at them in a different light. We began thinking there must be more to these guys. Anyone who can stand 30,40,50 days without food must have something. They never wavered once". "Albert" has the same admiration for the hunger strikers’ relatives whom, he says, he never saw waver. The relatives would come in, "… pat them on the back, tell them they were doing a great job…, giving them encouragement, telling them they looked great. This was to a boy whose stomach had shrunk down till you could see the spinal cord. It was like looking at Belsen photos". Only on being escorted out of the prison would the relatives break down and show any emotion. "You could see the mothers’ tears alright, but not in front of the prisoners" says "Albert", adding that he "… used to go home after spending nights in the [prison] hospital and walk around the garden trying to come to terms with what was going on. It left a deep impression on everyone in there at the time". One of the prison doctors was later to commit suicide. Even such a despicable arch-reactionary person as Mrs Thatcher, whose government oversaw the deaths (deliberate murders would be a better term) of these ten finest of human beings felt constrained in her autobiography to admit that "it was possible to admire the courage of Sands and the other hunger strikers who died…"
When the hunger strike began, it was typically ignored by our ‘free’ media, the government, the Labour Party and, with a few honourable exceptions, by the trade union leadership and what passed for ‘left’ at the time, until, with the sudden death from heart attack of the independent nationalist MP for Fermanagh and South Tyrone on March 5 1981, events took a dramatic turn. The Republicans decided to put Bobby Sands up as a candidate in the by-election. It was a huge risk, for the authorities and the entire British ruling class was bound to portray Bobby Sands and comrades as "murderous thugs" devoid of popular mass support in the event of his defeat in the election. The decision taken, the Republican movement got on with the election campaign with characteristic energy and seriousness of purpose for the candidate who in his nomination papers described his profession as "political prisoner". On a massive turnout of 86.8%, Bobby Sands won with 30,492 votes to 29,046 for his opponent. When the news of his victory was heard by prisoners in the Maze on their illicit radios, the whole place erupted. "For 15 minutes", says Lawrence McKeown, who had himself fasted for 70 days and was saved by his mother’s intervention, who exercised her legal right to save the life of an unconscious next of kin after he had gone into a coma, "we were shouting and roaring". 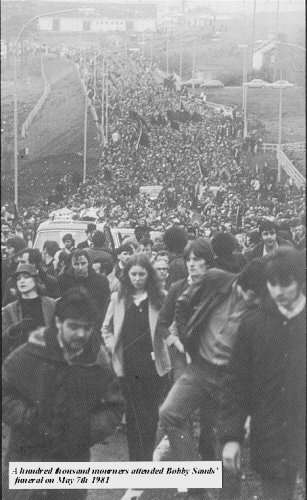 Bobby Sands’ stunning electoral victory electrified the political landscape, with the strike becoming newsworthy on a global scale, and requests for interviews coming in at a rate even the Republican movement, with all its organisational abilities and skills, found at times difficult to cope with. Bobby Sands’ writing became a best seller. No longer could the British government clam that the hunger strikers were lacking in support in the community. Thatcher’s government was in serious difficulty and under pressure to give in. High-powered delegates, including a papal emissary, swooped into the Maze to broker an agreement. In vain did the likes of Daily Express try to dub Sands as "the Honourable Member for Violence". In the end, nothing came of these attempts, as the Thatcher government was determined with the full support of the Labour Party opposition to see these young men die. Its response to Sands’ victory was to change the law so as to prevent prisoners from standing for Parliament. Bobby Sands was 40 days into his hunger strike at the time of his election. 26 days later, after 66 days without food, he died at 1.17 a.m. on May 5. According to "Albert", the body of Bobby Sands was smuggled out through the gate at the rear of the Maze just in case the Republicans should try to seize it. Sands’ death sent shockwaves throughout the world. Even the speaker of the British House of Commons, at the time, George Thomas, was compelled to respectfully announce: "I regret to inform the House of the death of Robert Sands, Esquire, the member for Fermanagh and South Tyrone". Europe and the US witnessed large protests, some violent, at the death. The Queen was heckled on a visit to Norway; the US Longshoremen’s Union boycotted British ships; the Soviet Union, and Cuba condemned British oppression in Ireland. Over 100,000 people marched behind Sands’ coffin, with the IRA giving him a fallen soldier hero’s farewell with a volley of shots. Three months later, on 20 August, Owen Carron, Bobby Sand’s election agent, regained his parliamentary seat with an increased majority. Kieran Doherty, another hunger striker was elected to the Irish Dail a few weeks before he died on August 2. Other hunger strikers went to their deaths. Hughes died a week after Sands, McLeesh and O’Hara both fell 10 days after Hughes. To the accompaniment of this macabre tragedy in the Maze, the British establishment was gaily participating in the festivities in connection with the wedding of Prince Charles to the late Diana. Northern Ireland was in turmoil, as more volunteers stepped in to replace those on the "conveyor belt of death". The hunger strikers’ resolve was undiminished to the last. Bobby Sands, as he was literally breathing his last, told a visiting friend "tell the lads I’m hanging in there and I’m alright". One cannot but have the greatest of reverence for such heroic courage, whether or not one agrees with the tactic of hunger strike as a method of struggle. Such resolve can only be the product of the discrimination and oppression that Bobby Sands, like a multitude of other youths, underwent at the hands of the British occupation forces and their bigoted stooges in the north of Ireland. During his boyhood his family had been driven out of Rathcoole estate, a predominately loyalist place in Belfast; in his teens he was forced to give up his apprenticeship with a Coachbuilder by loyalist thugs. Not surprisingly, by 18 he had joined the IRA, becoming a leader of the IRA’s West Belfast Unit. He had spent a major portion of his life in prison, where for 5 years, he and his comrades had been fighting for the restoration of their "special category status". The right to be treated as prisoners of war, not as common criminals, as the authorities portrayed them. It was this struggle which, via the "blanket" and "dirty" protests developed inexorably into the hunger strike. The hunger strike was eventually ended by 3 October through the intervention of a reactionary Catholic priest, Father Denis Paul, who has deservedly been dubbed ‘Mrs Thatcher’s priest’ and has since become "a pariah and a leper" to use his own words. Soon after the termination of the hunger strike, James Prior, who had replaced Humphrey Atkins as Northern Ireland Secretary, granted all the demands of the prisoners, including the politically symbolic right to wear their own clothes instead of prison uniform. With this the pretence to portray the prisoners as ordinary criminals was all but dropped. The hunger strike brought the liberation forces money, recruits and international recognition. 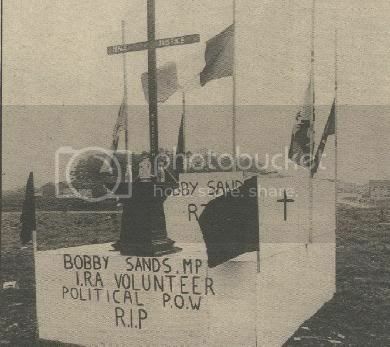 Sands’ election victory opened new channels for the furtherance of the cause of Irish national liberation – supplementing the armed struggle with struggle in the parliamentary arena. In 1984 the IRA bombed the Brighton hotel at which Mrs Thatcher and her close colleagues were staying in an action characterised by Danny Morrison as "the hunger strike coming home to roost for Mrs Thatcher". Following the hunger strike, the Republican movement continued its fight for liberation with an Armalite in one hand and a ballot paper in the other, forcing the British government, through the Good Friday Agreement, to recognise the rights of the nationalist community. Sinn Fein has achieved remarkable victories and it is on the verge of overtaking the SDLP in the electoral arena (in the 1998 assembly elections it secured 17.6% of the vote against SDLP’s 22%) while the IRA refuses to hand in its arms. 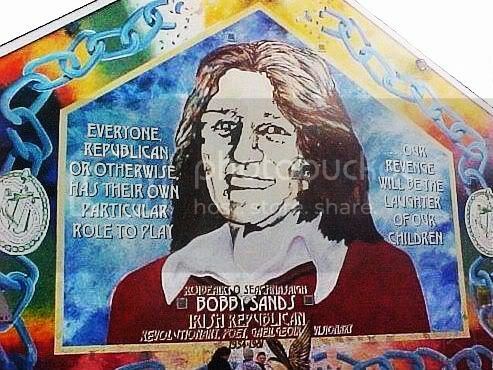 Bobby Sands used to say that "Every Republican has his own particular part to play". Certainly he and his fellow hunger strikers have played a great historical part in strengthening the cause for Irish liberation. He was also fond of saying: "Our revenge will be the laughter of our children". This revenge is well on the way to being fulfilled. The Maze is no more; Thatcher is all but dead in every sense of the expression; the Northern Ireland statelet, with its characteristic bigotry, is smashed, never to be restored; the Unionist camp is fast disintegrating into warring factions bent on mutual destruction; Sinn Fein is on course to become a force in the 26 Counties; no force on earth can stop complete Irish unity, even if the process is complicated. Bobby Sands and his comrades are well on the way to being avenged through the laughter of their children. On this, the 20th anniversary of their martyrdom, their supreme sacrifice in the cause of Irish liberation, Lalkar joins the liberation forces on the entire island of Ireland in saluting these great heroes. They are heroes not just of the Irish people, but of the entire progressive humanity. (Quotations throughout this article have been reproduced from a special report by Martin Fletcher in The Times of 16 March 2001). **For anyone who happens upon this site, I am just beginning to fix it up. All the other files are here or here. I add to them whenever I find anything about Bobby. My grandfather once said that the imprisonment of the lark is a crime of the greatest cruelty because the lark is one of the greatest symbols of freedom and happiness. He often spoke of the spirit of the lark relating to a story of a man who incarcerated one of his loved friends in a small cage. The lark, having suffered the loss of her liberty, no longer sung her little heart out, she no longer had anything to be happy about. The man who had committed the atrocity, as my grandfather called it, demanded that the lark should do as he wished: that was to sing her heart out, to comply to his wishes and change herself to suit his pleasure or benefit. The lark refused, and the man became angry and violent. He began to pressurise the lark to sing, but inevitably he received no result. so, he took more drastic steps. He covered the cage with a black cloth, depriving the bird of sunlight. He starved it and left it to rot in a dirty cage, but the bird still refused to yield. The man murdered it. As my grandfather rightly stated, the lark had spirit--the spirit of freedom and resistance. It longed to be free, and died before it would conform to the tyrant who tried to change it with torture and imprisonment.I feel I have something in common with that bird and her torture,imprisonment and final murder. She had a spirit which is not commonly found, even among us so-called superior beings, humans. Take an ordinary prisoner. His main aim is to make his period of imprisonment as easy and as comfortable as possible. The ordinary prisoner will in no way jeopardise a single day of his remission. Some will even grovel, crawl and inform on other prisoners to safeguard themselves or to speed up their release. They will comply to the wishes of their captors,and unlike the lark, they will sing when told to and jump high when told to move. Although the ordinary prisoner has lost his liberty he is not prepared to go to extremes to regain it, nor to protect his humanity. He settles for a short date of release. Eventually, if incarcerated long enough, he becomes institutionalised, becoming a type of machine, not thinking for himself,his captors dominating and controlling him. That was the intended fate of the lark in my grandfather's story; but the lark needed no changing, nor did it wish to change, and died making that point. This brings me directly back to my own situation: I feel something in common with that poor bird. My position is in total contrast to that of an ordinary conforming prisoner: I too am a political prisoner, a freedom fighter. Like the lark, I too have fought for my freedom, not only in captivity, where I now languish, but also while on the outside, where my country is held captive. I have been captured and imprisoned, but, like the lark, I too have seen the outside of the wire cage. I am now in H-Block, where I refuse to change to suit the people who oppress, torture and imprison me, and who wish to dehumanize me. Like the lark I need no changing. It is my political ideology and principles that my captors wish to change. They have suppressed my body and attacked my dignity. If I were an ordinary prisoner they would pay little, if any,attention to me, knowing that I would conform to their insitutional whims. I have lost over two years' remission. I care not. I have been stripped of my clothes and locked in a dirty, empty cell, where I have been starved, beaten, and tortured, and like the lark I fear I may eventually be murdered. But, dare I say it, similar to my little firend, I have the spirit of freedom that cannot be quenched by even the most horrendous treatment. Of course I can be murdered, but while I remain alive, I remain what I am, a political prisoner of war, and no one can change that. Haven't we plenty of larks to prove that? Our history is heart-breakingly littered with them: the MacSwineys, the Gaughans, and the Staggs. Will there be more in H-Block? I dare not conclude without finishing my grandfather's story. I once asked him whatever happened to the wicked man who imprisoned, tortured and murdered the lark? "Son," he said, "one day he caught himself on one of his own traps, and no one would assist him to get free. His own people scorned him, and turned their backs on him. He grew weaker and weaker, and finally toppled over to die upon the land which he had marred with such blood. The birds came and extracted their revenge by picking his eyes out, and the larks sang like they never sang before." "Grandfather," I said, "could that man's name have been John Bull?" Blown, by a breeze of yesterday. Yet, to be cut adrift from her. Or the "if" the "wish" or "might." While the seagulls are crying. **Here is another view of the Hunger Strikers Memorial in Hartford, Connecticut in the US from here. As you can see, the flowers are arranged to portray the Irish Tricolour. **This is a montage of 'mugshots'. Bobby is upper left, followed by the other nine hunger strikers. You can also see Lawrence McKeown, who wrote OUT OF TIME - Irish Republican Prisoners Long Kesh 1972-2000. This photo makes me so sad to look at. For the first seventeen days of his hunger-strike Bobby Sands kept a secret diary in which he wrote his thoughts and views.